Today's news websites are much more than publishers of static content. These websites are merely the most visible face of applications running non-stop, ingesting and generating news feeds, accessible through mobile apps and APIs, managing subscription data and more. 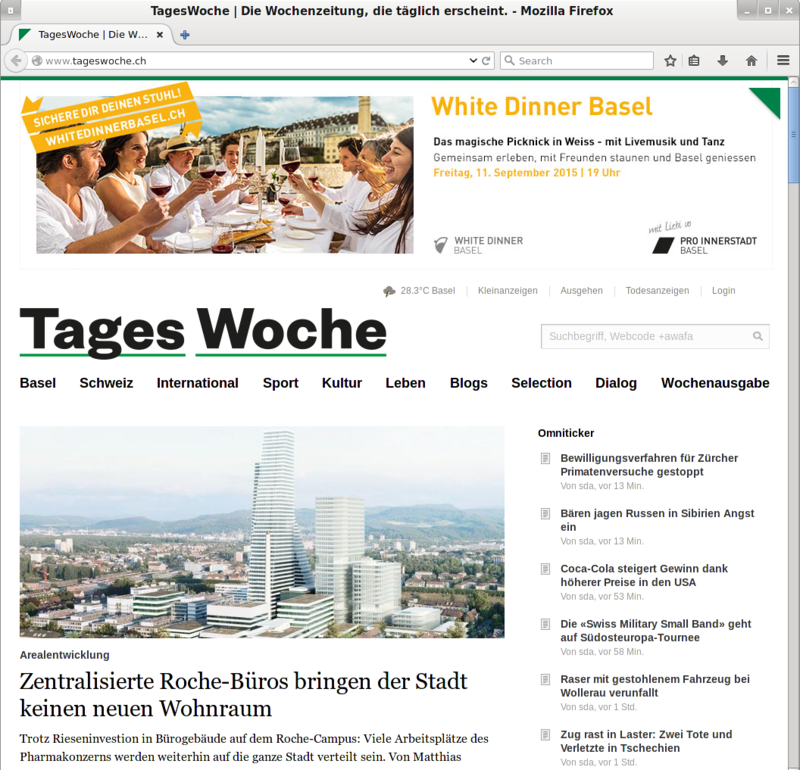 TagesWoche is ingesting content from the SDA news ticker, restaurant reviews, cinema and cultural events. Through the website and the TagesWoche mobile app, readers can manage their subscriptions and even book tables at those restaurants. The "Kleinanzeigen" classifieds allow the community to trade through the site. Content is delivered to mobile apps via the mobile API, while third parties gain access to the Content API or fine grained XML in RSS feeds. TagesWoche is run on Newscoop, the free and open web application developed by Sourcefabric. Newscoop is more than just an open source content management system for news websites; it is the realisation of more than 15 years of research and practice on digital workflows for journalism. Beyond this documentation, you can find more information about Newscoop on GitHub, Wikipedia, our Wiki system and of course our website http://newscoop.sourcefabric.org where you will also find links to related resources and the source code. This documentation will provide an overview of all the features the TagesWoche system is providing, ingesting and processing as of July 2015. It combines all TagesWoche-specific features with a description of the Newscoop maintenance and support setup. Much of the documentation is aimed at developers. We offer a general introduction to each section, to outline the content in a way that makes it accessible to editors and decision makers as well. These introductions contain screenshots meant to illustrate the numerous features of the application and how they manifest on the TagesWoche website. A Newscoop project usually consists of three technical layers: Newscoop core, Newscoop plugins and the respective Newscoop templates; you will find separate sections for all three. Additionally, we document the APIs (mobile API and REST content API) in separate chapters. In another section, the setup for feature development, the staging environment, the deployment process and Sourcefabric's support approach is described in full detail. We hope that this extensive documentation awakens your taste buds for more. With the Content API, the templating system, caching and the modular plugin system, Newscoop can adapt to your needs in both directions: shrink to fit as well as scale up. Enjoy the read. You will find some dry spells, which is always the case when documenting APIs. But we hope it is also a fun read in parts. First and foremost, we hope it inspires new ideas in journalism.